Where I live, the snow had almost entirely melted. We could see the grass and then...it snowed and snowed all over again. *sigh*. Oh well, it is only February. 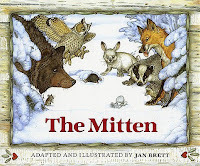 So, I read "The Mitten" story by Jan Brett. I have always loved this book, and recently came upon a book called "Don't Wake Up the Bear". The felt story pieces could certainly be used for both stories.